Stand Out from the Crowd with this Mouthwatering Barbecue Collection! With these sausages on the grill, you are sure to attract a crowd and do not worry, there is plenty to feed the whole crew! There is such a great range in flavors and styles, that you are guaranteed to have something for everyone as well. 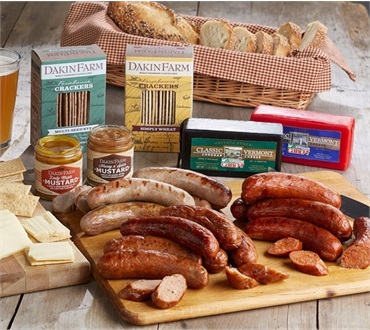 The Tailgate Grill features a plethora of crackers, Vermont cheddar and mustard to keep your friends, old and new, snacking and smiling while you are waiting for your sausages to be grilled to perfection!